I've been enjoying the whole StooShe "thing" up til now. Their first single, Betty Woz Gone, was funny and smart while dealing with some pretty serious issues - social services, drug taking, death. And I didn't mind Radio One playing Love Me to the point where the song lost all meaning, because it had more personality in it's opening bars than an entire box set of Saturdays albums. Their new single... Well, their new single is a cover of C And C Music Factory's 1990 novelty hit Things That Make You Go Hmmm. It doesn't turn out well for anyone. You see, for all of its epic naffness, the original Things That Make You Go Hmmm had a brilliant lyrical conceit. Each verse was a story, with a set-up, a pay-off and a moral - eg the wife who tests her husband's loyalty by leaving the house and sending over a girl in a tight dress; and who gets her comeuppance when it turns out the girlfriend had designs on her man all along. There are some nice little lyrical touches, too: Like when rapper Freedom Williams says he and his best friend Jay "are so damn close we're the same blood type". And it includes the awesome Apache drum break, which was obligatory for any rap song released between 1987 and 1992. StooShe keep a lot of the C&C song's lyrical structure - and lot of the content - but they completely strip out the narrative and the humour. They replace story-telling with a few cheap innuendos and a lot of waffle about how "controversial" StooShe are. I mean, come on. It's not like they've slaughtered a goat and eaten its entrails live on T4. 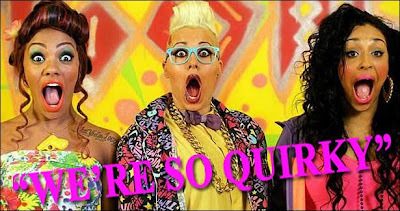 You'll also notice that StooShe waste a lot of time rapping about lipgloss and nail varnish. That's because the song has been placed in an advert for a range of make-up. The whole thing is cheap, pointless and tawdry. And if you don't believe me, here's the original, which looks like a masterpiece in comparison (even though it has one of the most hilariously mishandled videos of all time). While we're here - you should take a listen to Clivillés and Cole's remix of the song. A slow-building house groove, it has literally nothing to do with the rap version. I'd rate it as one of the best remixes of the entire 1990s - especially that gospel piano that kicks in around the 1'40" mark.